Note: this pattern has been re-done to reflect a new technique and a slightly different shaping. Some of what I say in the text may no longer apply! A friend of mine has taken over a local knitting shop and I have been making a few things for her, both as display items and to add to her little section of handmade goodies for sale. She does super cute crochet bunting (love her beach huts!) and I thought I would make her some heart ones. Now, you generally head to t’internet when you need a free pattern. I did. I must have looked at 100 patterns. They seemed to fall into two basic categories. By far the most common was: Knit a heart. Knit another. Sew them together. I did not need to add “second heart syndrome” to my already terminal case of “second SOCK syndrome” so that was never going to work. 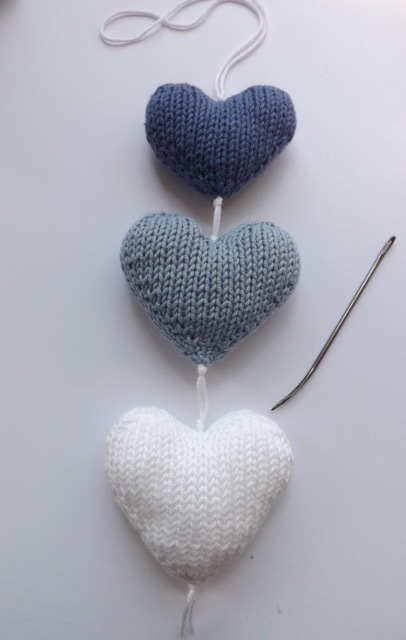 The second common one was to knit the heart in the round and graft the top of the heart bumps (or in one case knit back and forth then mattress stitch up the back.) Most used a M1 increase, with the opposing K2tog/SSK decreases. That doesn’t bother me, except I tend to have to look at the pattern cause I will always forget which way they lean, so mix up how to load the M1 to make it go the way I want. I hunted and hunted for a “lazy version” – i.e. knit it in the round, simple increases and decreases, and be done. No such luck. So I created a version that I like – and although it isn’t the most elegant heart, compared to the grafted ones, I think it is the fastest. A bonus if you want to make 100 to decorate your wedding tables, especially if you are planning on hiding the middle V with flowers or something! You can do them on DPNs, but the 3-stitch start is way easier with Magic Loop. Slightly fiddly, but not enough to offset having to make 2! I’ve also added the trick for a smoother KFB. 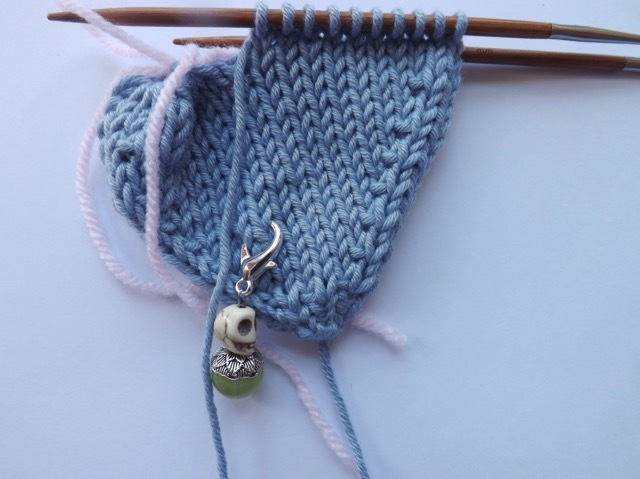 That is to knit into the front of the stitch but then, rather than knitting into the BACK, slip the needle in and scoot the back off onto the right needle. You have still made two “stitches” from one, and no unsightly bar. So the MK1 instructions have been removed from the pattern. Here is the pattern. And here are some photos to explain the heart bump sections. 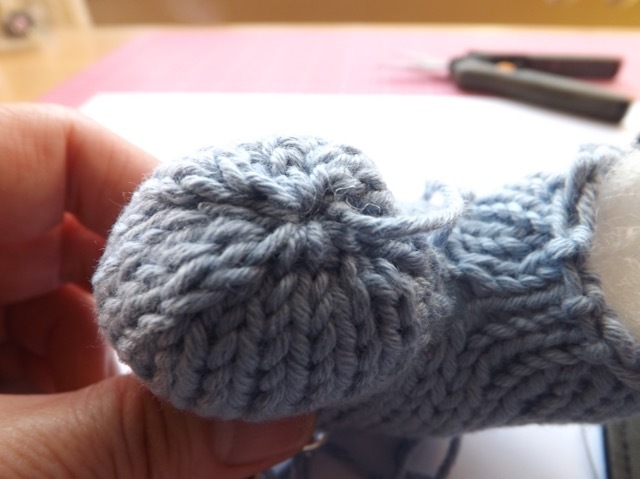 This shows knitting the first half, then slipping the stitches on to a holder. Take a moment to note how stinkin’ cute my stitch marker is LOL! and thread the tail thru the final stitches but DO NOT GATHER. Now, with the new end of the yarn, thread a needle. Use this to secure the middle stitches. I like to knit the first stitch with the end and the working yarn together, for a more secure join. 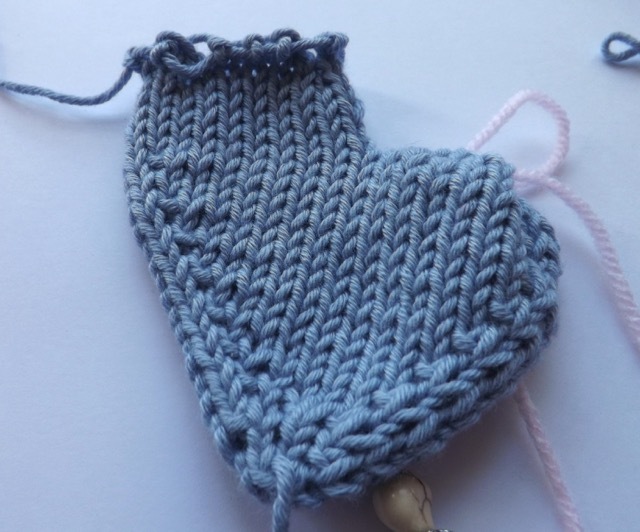 Then carry on and knit a round (to match the round that you used to divide the heart) then repeat the heart bump stitches again. Stuff and gather the tops. Use the tails if you need a couple more stitches to close the middle once it is stuffed. This is cotton yarn and it is a lot less forgiving than wool or even acrylic – it doesn’t spring back when stretched so another stitch or two is sometimes needed. See what I mean? A lot less elegant than grafting the few top stitches, but a lot less work too. 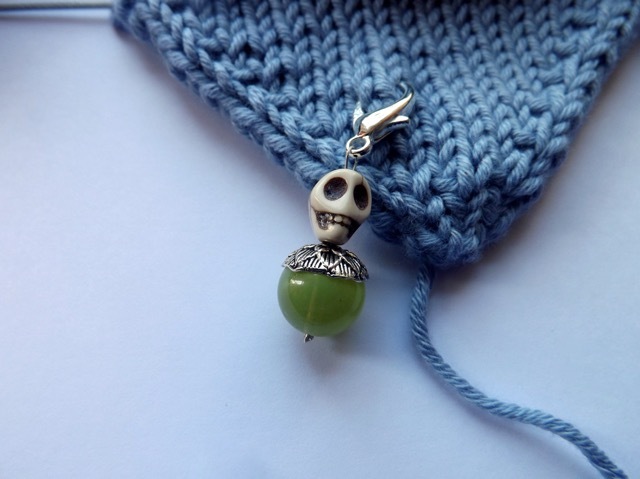 You can play around with the stitch count as well as the needle size and yarn. Just use a smaller needle that the yarn calls for so you get a nice tight weave and so the stuffing doesn’t show thru. I think the very smallest one did the 2-round-knit-pairs after there were 14 stitches on each needle and stopped with 18 stitches rather than 20. 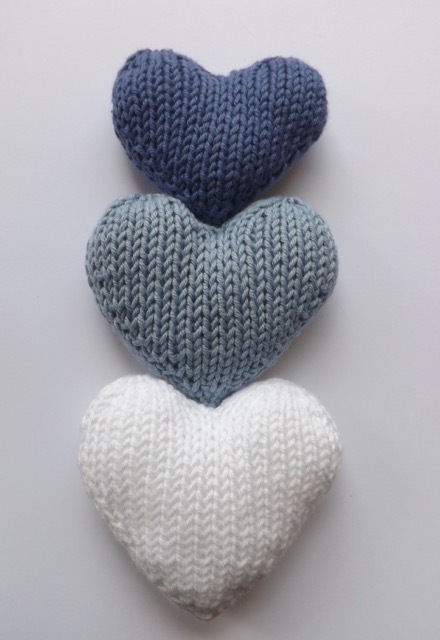 You can also add more 2-round-knit-pairs for a longer, more folk-art style heart. 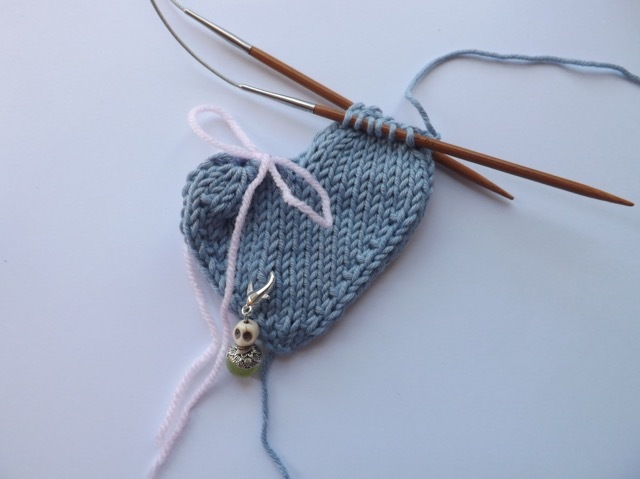 The white heart had an additional 2-round-knit-pair after the 14 per needle round, as well as after the 16 per needle round. When you read the instructions, that will make sense! I made a quick hanger, by threading the three hearts on a length of yarn, with knots to separate. I need a much slimmer needle so I can add beads instead – with them snugged up to the V, they will totally hide the few closing stitches. I am working on another thing, and another book-folding alphabet, by request, but I’ve had side effects with two of my heart meds (hands up if you hate statins!) and it is causing me problems. I’ve already ditched the tickle-y cough by changing one med and with luck now I am off the statins, I’ll start to feel more energetic. Hopefully I’ll finish both by the end of the week. But I doubt I will ever return to daily blogging. Miss seeing you in my e-mail notifications…. truly hope things are going good for you and that you are feeling better!! why thanks! The new house, DDs education and PIP issues, and some hopefully minor but annoying health issues of my own have kept me from regular blogging. I have been more focused on knitting which I am not good enough at to really showcase on my blog. 🙂 Nice to know I’ve been missed. I do still send out lots of book folding templates by request so not totally absent. cheers for the kind words.